Such a great week! 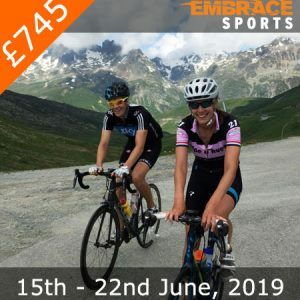 would highly recommend for a seasoned Ironman racer or anyone looking to step up to the distance & what a beautiful setting! 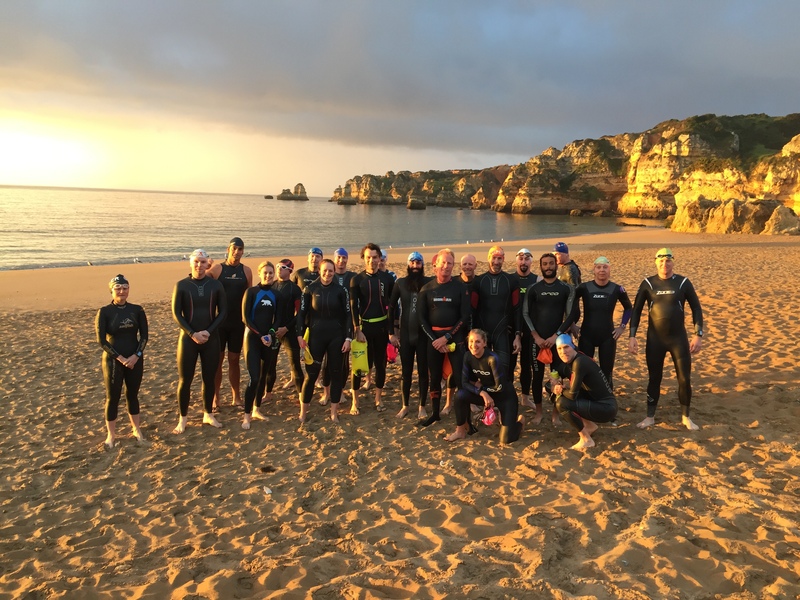 Sunrise swims and rolling algarve countryside! Was nervous before going as is the first training holiday I’ve done but as soon as i arrived Neil and the team made me feel welcome. The sessions were well organised and always focused and challenging (as you would expect from an iron distance camp). You will be pushed and encouraged to go that little bit further, that little bit faster and i wouldn’t hesitate to reckoned to anyone looking to get away and train! Thank you to all the coaches and other Triathletes who made this a really great experience, i can’t wait to get out training again!!! Second year with Embrace, but first time on the Iron camp. Still the same amazing experience. The awesome homemade food is still worth the money alone, and the attention to detail in terms of structure of the week never fails to impress. The fact they try to accommodate the prior experiences of those who have been before to give us new routes up climbs etc, is really appreciated. Another great trip with Embrace. I finally made it to the Portugual camp & it definitely didn’t disappoint. Awesome food and company of fellow athletes made it all the more enjoyable. The coaches delivered in fine form with the usual array of energy, positivity and general good humour. I tried to keep my birthday a secret, but they don’t miss a trick. This was my third Embrace Holiday, and definitely not my last! I have loved each Embrace camp I’ve been on, but this is my favourite so far. It was my first iron distance camp, and I’m so glad I took the plunge to try this longer distance training. I felt right at home in the crowd of athletes and coaches, and thoroughly enjoyed all of the sessions. The food was even better than I remember it from previous holidays, and the weather was perfect for triathlon training. The coaches also went above and beyond to help me when I got some mechanical difficulties with my bike! Thanks again, guys! I’ll be back! Can’t help but simply reiterate everything I said last year. 2nd time around is even better because coaches remember you and there’s no anxiety. The program, places and faces are familiar so you get in ready to rip into a great volume week of training. Plus, you have benchmarks to use. Simply said, these guys rock! “above and beyond one of the best holiday and training experiences! The fact that it could be both is incredible. The coaches are super knowledgeable and they have structured the camp perfectly to meet all of your desires. It’s well conceived so that you can manage what seems like an overwhelming amount of training first, but since it is so well organized and designed, you are pushing your limits beyond what you believed you are capable of. It helps that once you arrive, you are completely in the hands of professionals. You don’t have to fret about any decisions, which makes the holiday part of it all the better. The accommodations and food are top notch. Have more confidence and more knowledge know in a few days here than what would otherwise takes years to accumulate. What a fantastic week. For what I am hoping to achieve I think I am heading in the right direction. Nevertheless there is nothing like putting in a weeks training like this without the pressures of work and home life. Delivered in a family environment of apartments round a pool. I am so glad the philosophy is to get out actively as opposed to sitting round listening to people. With a wealth of experience and knowledge it was passed down in a friendly and helpful manner. Recovery was helped by excellent food and nutrition. The week was very good value for money. I would have no hesitation in coming back or recommending you to others. Thanks for a great week and good luck in the future. Spacious comfortable accommodation, delicious food and a superb location close to the sea. Add to that a packed week of training with like minded individuals and you have a a great training holiday. Recommended to anyone who is thinking of such holiday for the first time. Really fantastic week. A great mix of quality training, friendly people, very tasty and plentiful food & drinks and fantastic coaches. The Portugal venue is very good. Spacious & clean apartments looking over the pool. The coaches are all so helpful and friendly and do a great job of managing a group of varying abilities so that everyone can get lots out of it. It also really feels like a holiday as everything is sorted for you – so despite some hard training, you get a break from your work life and can come back feeling refreshed and fitter! Thank you! My third Embrace camp, first time on the longer distance tri camp. It did not disappoint, as great as the previous two, brilliant coaching team, superb food, lovely bunch of people to be with and some really good solid training in fantastic scenery. Would recommend to anyone. 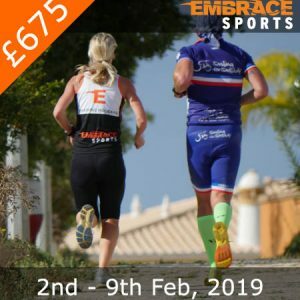 For anyone looking at 70.3 or Full Ironman races (from first timers to Kona contenders) I can’t recommend this pre-season camp enough! (This was my fourth one!) 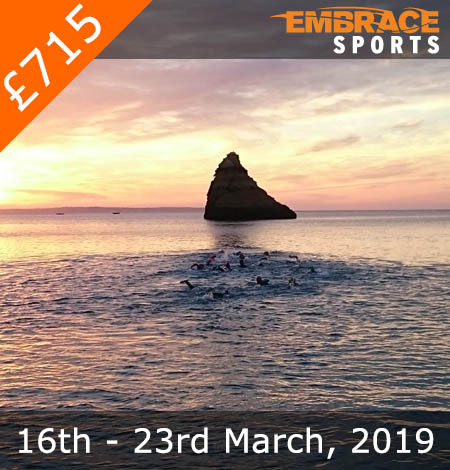 It’s a chance to kickstart the race season from a strong volume week with great coaching (both attitude and depth of knowledge) and the opportunity for some warm weather open water swims and rides before it’s really possible elsewhere in Europe. Already planning to be back again next year! Well as a couple I travelled with Catherine my other half who is not an athlete. She was happy to do her own thing while I trained but seemed to fit right in mind you she was drinking my share of the wine. even got her in the sea. I have done some Tri camps at La Santa before and a lot of cycling holidays training camp. This was different in that while brilliantly organised its more like the club holiday feel but with great organisation. Example of this is that they looked at weather and moved training to fit it, Swimming while sea calm etc. The bike rides were bit odd to a cyclist use to riding standard two by two and changing. The training aspect of the course was clear from day one when after first 15 mile we stopped and they said we are doing a 10K TT. This was continued through the week breaking up rides to allow a series of efforts then regrouping. Idea behind this is two fold all ride at own ability and gets some solo effort time in Vital to Ironman. The best think is the staff knowledge of the area, Going abroad always a nightmare but not needing to worry where we were going and the stunning roads was a surprise to me and the mountains made me grin from ear to ear. Was good that the ability range was quite narrow even across 3 sports. I’m a little on the veteran side but still found it manageable but some of the guys ability at running sun 4 min kilo off 112 mile bike ride deserves respect. All in all id recommend it to serious triathletes, great value for money friendly and the location and facility cant be beat. 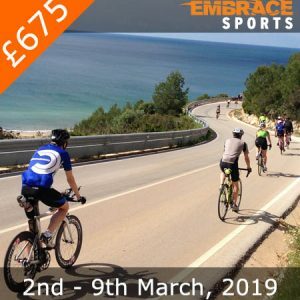 The guys really know their stuff – and being back for a few days now and completing my first few training sessions back in the UK, I am already feeling fitter and stronger – all thanks to the Embrace guys! Additionally, the team (and the other guests on the week) were all keen to share their experiences of long distance races, and gave plenty of tips for the big day. I feel way more confident about my first iron distance race in a couple of months. Would definitely recommend to anybody – they definitely cater to all abilities. Great environment, coaches, training plan and food!! This camp made more than 24 hours flight worth it!!! Awesome experience, with great tips and coaching; when I saw the overall program, I was not very sure I was going to be able to complete it, as impressed and happy I could be…. I ended up packing all my stuff on Saturday not only with many kilometer s completed but with the satisfaction and sense of accomplishment that I completed every single training. Very happy I was part of this camp, and looking forward to training harder in order to complete my IM distance later in the year!! Kuddos Embrace team!! (Another!) great week of full immersion in training with an excellent schedule, like minded people and top level coaches! Definitely ready for the start of the season now! This was my first Embrace training holiday and I now totally get why everyone raves about them! Looking at the training schedule at the start of the week I wondered how it would all be possible, but I am living proof that it is, and that you come to the end of it feeling like superwoman (man). I loved training with the coaches and such a wonderful group of like-minded long distance triathlon folk. The coaches are utterly inspiring, and yet totally down to earth at the same time, always up for a laugh and a drink, and boy do they look after you well! Not only in the training sessions, but the food is awesome, and plenty of it! Can’t wait for my next Embrace holiday! Another fantastic week with Embrace. Pushed hard all week and left feeling shattered but chuffed just how much you can achieve with the right motivation and coaching. Made loads of new friends and reacquainted friendships from last year. These camps are starting to feel like a home from home. Fantastic food and plenty of it. Good to have a few new locations and activities such as the sea trek whilst retaining old favorites such as the woodland trails. Taking a different route up the Monchique mountains was great as you get to see a little bit more of this wonderful place. Watch out guys…..I’ll be back!! 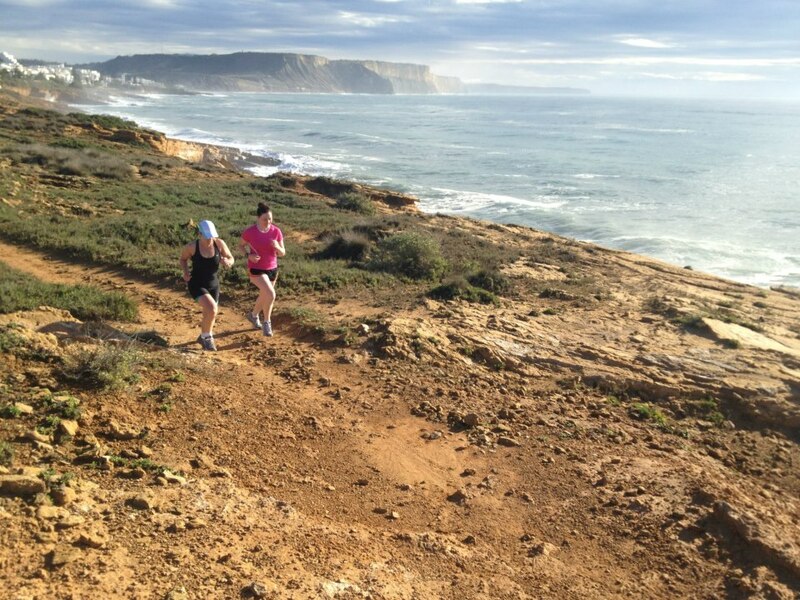 Great training holiday with like-minded people, great location and a good programme. Early morning sea swims were (ahem) refreshing, and training across the three disciplines was pitched just right, meals out (and meals in!) and the vineyard visit were a nice change. Great advice from the coaches – from the sea swim ‘ attack the waves’ to the run failings ‘run more often’ which worked a treat, to the mental challenge/ Ironman spirit ‘the body can do it, the head just needs to tell it’. A great week with good steps in the Ironman journey and good friends made. This was my first Embrace camp. I found it challenging but looked forward to every day. I was pushed beyond what I had thought were my limits. This camp had beautiful scenery, amazing food, and great coaching staff. The accommodations were excellent. I’d highly recommend this camp to anyone regardless of ability. Above and beyond one of the best holiday and training experiences! The fact that it could be both is incredible. The coaches are super knowledgeable and they have structured the camp perfectly to meet all of your desires. It’s well conceived so that you can manage what seems like an overwhelming amount of training first, but since it is so well organized and designed, you are pushing your limits beyond what you believed you are capable of. Again a challenging and perfect week. After meeting at the airport all is take care of: training sessions, food, planning, transport. So we can concentrate on joining as many training as we can. Good food, excellent coaching, good company and nice apartments: perfect combination. We will for sure be back next year. What an incredible week. Great food great company professional coaching , what more can you ask. It has improved my confidence no end I’m just sad to have to get straight back to work. Had another thoroughly good week of training with a great group of like minded people. You soon trust the coaches experience and knowledge to do more than you think capable of and finish the week stronger both physically and mentally. This was my first but definitely not my last Embrace Sports training week. Had an absolute blast and learnt so much from the guys. Came out of the week feeling fitter, stronger and a lot more confident about my first upcoming Ironman race. The coaches were great, very friendly and knowledgeable. Always helping out and making sure you pushed yourself to your limits. No question went unanswered and i got a huge amount of advice that’s really helped me with my personal training as well. Felt i got a lot of one-on-one with the coaches when i needed it. The food was amazing, the rooms spacious and clean, and had a great area next to a pool to help recover from the training in the sun. Would recommend this to anyone doing triathlons and wanting to get better and faster. This was my second Embrace Ironman camp. I was anxious it wasn’t going to be as amazing the second time round? I shouldn’t have been worried, as it was even better if that is possible. Nothing was repeated, there were new routes, venues and sessions to keep me guessing. The camp is super organised and the training is structured with lots of thinking beforehand and the food is awesome. I’ve been to 4 different tri camps with embrace sports and each time was a great experience. Great coaches, great food, awesome friends. You can’t go wrong with these guys. Worth the trip overseas.